As we try and use less plastic one thing that we’ve noticed that we do buy from the grocery store a lot is coconut milk. The cardboard containers come with plastic lids that are non-recyclable and don’t ever decompose. If you go for the canned coconut milk, it is lined with BPA. 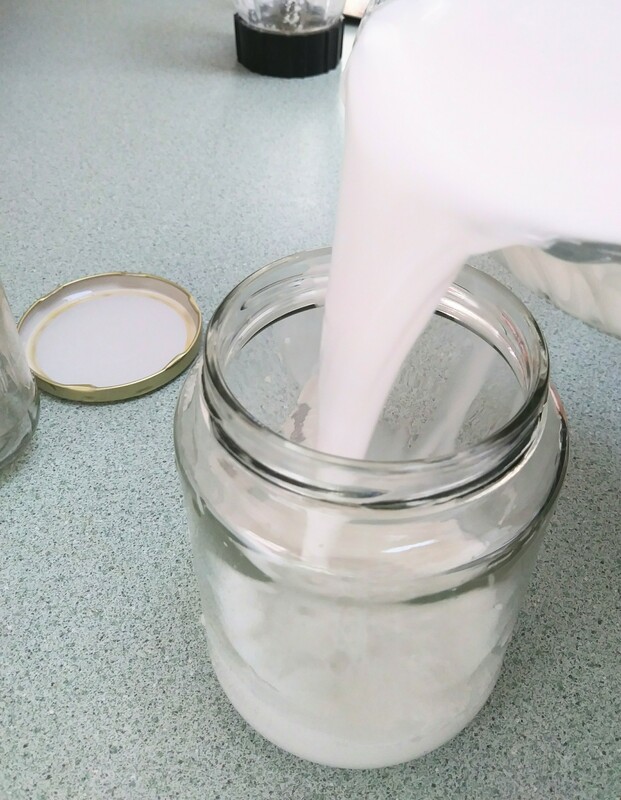 So we started making coconut milk at home and putting in our own glass bottles. It’s so creamy and way better than the store-bought stuff. Making coconut milk at home is easy and super cheap. Homemade coconut milk costs less than $1 a batch, and it can be used in smoothies, recipes, as coffee creamer or just to drink by itself. It can be flavored with natural vanilla, strawberries, or cocoa powder. Put water into medium saucepan, add coconut flakes and bring to a boil. Then reduce heat and let simmer for a few minutes. Blend mixture in until thick and creamy. Then pour through a colander lined with cheesecloth. Squeeze any remaining milk from cheesecloth. The cooked pulp can be set aside and made into coconut flour. store in the fridge. Since there are no preservatives it lasts in the fridge for 4 or 5 days. The cream of the coconut milk will separate in the fridge, shake it before drinking.